During the penetration testing or vulnerability assessment or hacking, staying anonymous is one of the important factor. Without it, the internet connection will reveal your identity. kali linux is good for penetration testing because it will come with pre-installed hacking tools. In this tutorial we are goning to achive the anonymity by using ProxyChains and Tor. ProxyChains is proxifier for linux system. It allows TCP and DNS tunneling through proxies. It supports HTTP, SOCKS4 and SOCKS5 proxy servers.It uses multiple proxies at a time, so it is called Proxy Chaining. If you want to install kali linux on virtualbox, please click the above link. it will expain you in detail. Tor is free open network that enables anonymous communication and helps you defend against network surveillance. In kali Linux, open terminal app. In the terminal type the below code and hit the enter key. Press y and hit enter to confirm the installation. 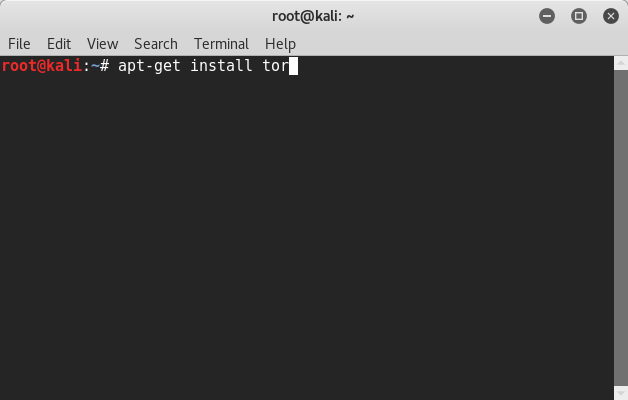 In Kali Linux proxychains is already comes with pre-installed and if you don’t have, just run the below command in terminal to install it. After the successful installation of proxychains, run the below code in terminal. It will open the proxychains config file in the leafpad text editor. Now find the strict_chain and comment the strict_chain line by adding a hash in front of it. Then uncomment the dynamic_chain by removing the hash. For more info please refer the above screen shot. Add more than 5 for better result. It is useful if one of the proxy is down, then it will automatically go to the next proxy in the list without throwing an error. Proxychains with tor will make make detection much harder and it will help to stay anonymous. Also use do not tracking in your browser and use duckduckgo as your search engine to increase your anonymity level.